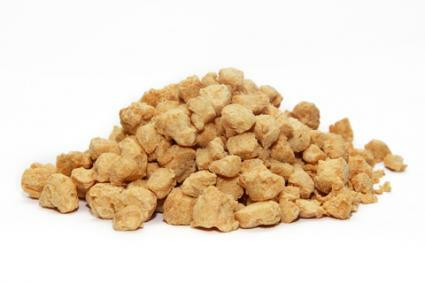 Textured vegetable protein (also known as TVP) is one of the first commercially available meat replacement products for vegetarians and vegans. Many vegetarians and vegans from the 70s will remember TVP as being the only option that was readily available to them. TVP is made from a soy flour mix which is processed to produce a range of different shaped pieces that are dehydrated. The dehydrated pieces have a long shelf life and can be rehydrated and used as a replacement for meat in many dishes. While textured vegetable protein is well established, it often gets overlooked in the modern meat replacement market. It is often sold as a generic, commodity product and in bulk, and therefore does not have the large marketing budgets of big-brand products. Unflavored textured vegetable protein can be purchased in bulk from health food stores and from large supermarkets. This represents a very cost effective way of buying TVP. It is also possible to buy TVP that has been seasoned and formed into a mix for dishes such as chili. It is important for vegans to check the labels carefully; seasoning can sometimes include dairy products or other ingredients that are not suitable for a vegan diet. Honeyville: Find flavored TVP from Honeyville. You can order bacon, chicken or beef flavored TVP, as well as mixed cases that give a sampling of several different flavors. A 2-1/4 pound can costs just under $10. Barry Farm: Barry Farm's TVP is made using non-GMO soybeans. They sell both granulated TVP for "ground beef" style recipes, as well as larger chunks for use in stews. A one pound bag costs under $4. USA Emergency Supply: If you want a lot of choices and flavors for your TVP, find it at USA Emergency Supply. They offer combo packs, as well as sample packs of TVP flavored like beef, chicken, bacon, sausage, ham and tacos. Pricing starts around $7 for a two pound can. One of the key benefits of textured vegetable protein is its versatility and convenience. The dried product can be quickly rehydrated and used in a variety of dishes and recipes. The rehydrated textured vegetable protein can be added to dishes from Bolognese sauces to meatloaf style dishes and burgers. Larger chunks make a good replacement for meat in dishes such as stroganoff or curry. When rehydrated, textured vegetable protein will keep in the refrigerator for three days. Textured vegetable protein is naturally bland and this means that it is ideal for adding to a variety of dishes as it will absorb the flavor. The shapes of the pieces range from tiny grains that are similar in texture to ground meat to large chunks. This makes it easy to use in many recipes. Textured vegetable protein is a versatile food ingredient that can be used in many ways. Use it to add some texture, flavor and protein to your diet, either purchasing it pre-flavored or seasoning it yourself. You'll soon find that it helps open the door to a large variety of different dining options.